Several months after the controversy ended over imported milk powder, the issue has reached boiling point again, leaving people bemused and confused. 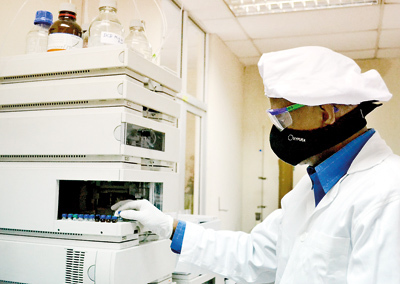 The Industrial Technology Institute (ITI) states categorically that Dicyandiamide (DCD) was found in random samples of four imported brands, while the two local brands tested negative. The milk in three of the imported brand samples had been manufactured in October-November 2012 and the other in February 2012. 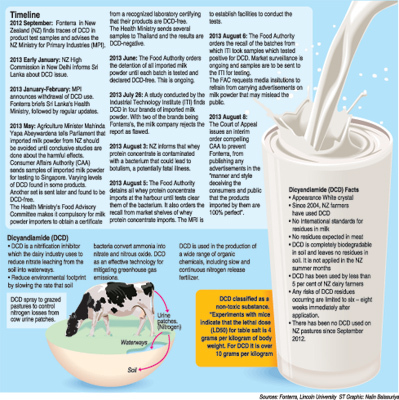 While defending its imported milk powder to Sri Lanka as being “absolutely safe” and never having DCD, Fonterra, the world’s largest dairy and Sri Lanka’s biggest milk supplier has got entangled elsewhere in another issue, a bacterial contamination of its whey protein concentrate which is used in many products including energy drinks and infant formula. The people, however, seemed no wiser even after numerous reports in the media, statements by high-level officials, serious allegations by the Government Medical Officers’ Association (GMOA) and the Food Advisory Committee (FAC) of the Health Ministry ordering the removal from market shelves the batches of milk that ITI found to be DCD-positive. The National Toxicology and Poison Information Centre at the National Hospital, meanwhile, told the Sunday Times that the World Health Organization (WHO) had listed DCD under the ‘non-acute toxicity’ category. The confusion in the minds of the people arose over a mix of the DCD issue and the recent Clostridium botulinum contamination of whey protein concentrate. In a separate decision, the FAC “detained” at the port of entry, all products manufactured with or containing whey protein concentrate until tested and found to be negative. Then only would they be released into the country. In this connection, Fonterra has categorically stated that it does not import these items to Sri Lanka. Reports by ITI on the ‘Establishment of rapid HPLC method to detect DCD in milk powder and analysis results of few selected milk powder samples dated July 26.The contention of the ITI is that the four brands of imported milk powder, Fonterra’s Anchor Full Cream and Anchor 1+ (manufactured in Oct-Nov 2012); Maliban’s Non-fat (manufactured in November 2012); and Diamond (manufactured in February 2012), tested by it contained DCD. The two local brands, Highland and Pelwatte, did not. Pointing out that “in milk you can’t have DCD”, ITI’s Chief Executive Officer and Director Dr. G.A.S. Premakumara said the sampling was “extremely random”. The samples, one for each brand, were collected from the open market in Colombo, he explained, adding that from each sample, the sub-samples were – 10 from Anchor Full Cream; 4 from Anchor 1+; 4 from Maliban; 2 from Diamond; 5 from Highland; and 5 from Pelwatte. To the query from the Sunday Times during a face-to-face interview on Thursday, why the ITI got into action to test milk for DCD in July, Chairman Prof. W. Abeyewickreme said that the Health Ministry inquired from ITI whether it had the facilities to check milk for DCD in May. Then we didn’t, but recently when the Technology and Research Ministry indicated an interest in DCD testing, the ITI which comes under the purview of this ministry established facilities in early July. The equipment ITI is using is High-Performance Liquid Chromatography (HPLC) along with UV Spectometry, said Dr. Premakumara. When asked by the Sunday Times what “internationally accredited” means, he said that once a laboratory gets this accreditation it is considered to be competent internationally. However, while a lab is internationally-accredited, the different procedures of testing carried out by that lab also need specific international accreditation, he said. The ITI has ISO 17025 and ISO 9001-2008, according to him. DCD analysis in milk is a new test and accreditation is yet to be obtained. The testing method is the very thing that is being hotly contested by Fonterra and at a packed media conference on Thursday at the Cinnamon Grand, Fonterra Brands Sri Lanka Managing Director Leon Clement kept repeating that the internationally recommended method to test for DCD in milk is the Liquid Chromatography Mass Spectrometry and not ITI’s UV Spectrometry. 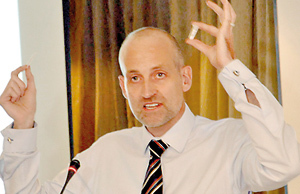 The method used at ITI can neither detect nor quantify, he stressed, at the high-profile media conference also attended by Alan Fitzsimmons, Managing Director of the Indian Subcontinent, Middle East and Africa,; Human Resources and Corporate Relations Director Roshan Kulasuriya and Associate Director for Regulatory and Scientific Affairs Dr. Sanath Mahavithanage. However, the ITI’s stance is that its method of testing for DCD in milk is not flawed. We stand by our test method. If there are false positives, how is it that the two local brands have not indicated false positives, asked ITI’s Dr. Premakumara. The Hibbert report deals with the positives and negatives thus: “The peaks indicated as DCD in spiked chromatograms do not have the same shape as those of injection of standards. They are too wide. In my opinion there could be more than one component eluting in that region of the chromatogram, which casts further doubts on the identification of DCD”. Reiterating that Sri Lanka has not imposed a blanket ban on Fonterra products, Fonterra Sri Lanka’s MD Mr. Clement said that the FAC has ordered the recall of the two batches (No. 1076I0163 of Anchor 1+ and No. 0605C0883 of Anchor Full Cream), samples from which had been tested by the ITI. Assuring that the two batches would be removed within 48 hours, he however pointed out that tests by the independent expert had found no DCD in samples of the same batches. “DCD is not listed as a food safety issue anywhere in the world,” underscored Mr. Clement, quoting international reports that DCD is three times less toxic than table salt. No milk food produced by Fonterra after 2012 has DCD in it, he said, adding that even in 2012 only four percent of farmers used DCD in their pastures. Independent and accredited laboratories have carried out 202 tests on Fonterra products in Sri Lanka and found no traces of DCD ever. Presenting a slide of the 500,000-litre swimming pool of the Cinnamon Grand Hotel, Mr. Clement said that for any harm to come about from DCD, a person would have to drink that quantity of milk with traces of DCD every day. “I love Anchor milk, but not as much to drink a pool of it every day,” he added. Meanwhile, initially when the DCD controversy raged around the world, it was the Consumer Affairs Authority (CAA), which on the instructions of President Mahinda Rajapaksa, sent five samples of milk powder for testing for DCD to Singapore. Those samples came positive for different levels of DCD (the range of 0.36 to 15.17, the Sunday Times reported on May 19 in ‘Wholesome questions), said a CAA spokesperson, adding that however a second set of samples sent after that came negative. Some samples sent to Thailand by the Health Ministry had also reported negative, it is learnt. “Puzzled,” is the Maliban Group over the ITI test findings of DCD in its non-fat milk imported from Australia. With the Food Advisory Committee of the Health Ministry ordering the recall of batch 13074A1, Maliban Group Chief Executive Officer D.L. Weerasuriya said the Australian Government has assured that DCD has not been used in the country’s pastures in the past 100 years and the ITI detection of DCD is puzzling. “There can be no possible way of DCD entering the Australian milk,” he added. 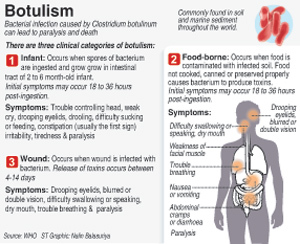 Botulism poses a real danger, warned the National Toxicology and Poison Information Centre, while pointing out that in the case of DCD, the World Health Organization has listed it in the non-acute toxicity category. With regard to botulism, measures need to be adopted and steps have already been taken by the relevant authorities, said Dr. Waruna Gunathilake when contacted by the Sunday Times. Referring to DCD, he said that the world renowned and credible databases, UKtoxbase does not give information relating to its toxicity while the database of the Pesticide Action Network (PAN), North America also does not provide toxicity details of DCD. DCD is not a reproductive or developmental toxin, according to PAN. Mixed reactions came from the public when asked about the milk issue. Most were unaware of the exact problem, but had heard of some issue. While some said that they would switch from the milk powder they were using currently, others said that they would continue to drink the same milk as other brands also had problems. Mahen Perera (42), Dammika Ranasinghe (35), H. Fathima (33), L. Rameshwari (22), C. Lewke (51), Seedevi De Soyza (57), Fathima Anisha (39), S. Mani (49), Sewwandi Samarasekara (36) and Iresha Keegale (27) said that they have changed from using powdered to fresh milk. She has switched to fresh milk with reluctance as her youngest child, aged 2, falls sick after drinking fresh milk, was the view of H. Fathima while Iresha had heard that a “chemical” was added to imported milk powder and switched to fresh milk. Seedevi, meanwhile, was of the view that it was a good opportunity to promote locally-produced milk. Weerarathne (60), Seyed Reza (31), W.A. Sunil (59), S.Thiyagaranjini (51) and Siththi, 65, said that they are not affected that much. Sunil said that he had not heard in the news about any problem and that since they have been using Anchor for a long time, he trusts the brand. Siththi pointed out that she finds it cheaper to use milk powder as it can be stored for a longer time, while Thiyagaranjani had heard that all milk powder imported from New Zealand has been banned by the Government, as it contained some bacteria. But she is used to its taste and will not be switching to any other milk. The Sunday Times interviewed Fonterra Brands Sri Lanka Managing Director Leon Clement. First it was melamine, next it was DCD and now it is Botulinum – something seems to have gone wrong with Fonterra’s production line and quality of products. Have the standards dropped? The three incidents are not related. Food safety and health are very much Fonterra’s top priorities and our standards have not changed. Sri Lanka is not a market affected by the recent issues. We are committed to being completely open and transparent and work closely with governments, regulators and customers to ensure that everyone has the information that they need about our products. Did Fonterra in Sri Lanka mislead the public with its earlier statements that there is no DCD contamination in the light of the current report by Sri Lanka’s Industrial Technology Institute (ITI)? No. Independent and internationally recognized testing laboratories, AsureQuality and the Cawthron Institute have carried out 202 tests on Fonterra’s consumer branded products in Sri Lanka and no traces of DCD were found in any of these tests. In addition since 1 June, all Fonterra products entering Sri Lanka have been tested for DCD to ensure it meets the DCD free standard set by the Government on 1 June. No traces of DCD have been found. The ITI test results have been analysed by an independent and internationally recognized expert in analytical chemistry – Prof. Brynn Hibbert — who has found that the testing method used by ITI cannot accurately confirm whether there is DCD in milk powder products. Please explain how Fonterra will “work” with the Government to clarify the situation? With whom will Fonterra work and how? New Zealand Government officials are today (Thursday) meeting with Sri Lankan Government officials to discuss the situation. Fonterra is working closely with the New Zealand Government to ensure that they have all the information that they need about Fonterra products. Has Fonterra at any time offered pay-offs, fully-paid trips abroad, payments for the education of children or any other incentive to Health Ministry officials, particularly those on the FAC? Has Prof. Brynn Hibbert (the independent expert) ever worked or been paid for any services rendered to Fonterra? Is there a conflict of interest? Prof. Hibbert is an internationally recognised expert in analytical chemistry. Fonterra commissioned him as an independent third party expert to analyse ITI’s methodology and test results. Have Botulinum contaminated Fonterra products come to Sri Lanka? No, no products using the affected whey protein concentrate WPC80 are imported into Sri Lanka. None of Fonterra’s branded consumer products are affected, in Sri Lanka or anywhere else in the world. How did the Botulinum contamination come about and when was it discovered? Fonterra initially identified a potential quality issue in March this year, when a product tested positive for Clostridium. There are hundreds of different strains of Clostridium, many of which are harmless. Product samples were put through intensive testing over the following months. On Wednesday 31 July 2013, tests indicated the potential presence of a strain of Clostridium (Clostridium Botulinum) in a sample, which can cause botulism. The tests showed the risk was minute, but it was a risk nonetheless, so we immediately informed the New Zealand Government, our customers and the public, and initiated the containment of the product. Were the Sri Lankan authorities informed about it? Yes. The Sri Lankan Ministry of Health was informed by the New Zealand High Commission in Delhi on Friday 2nd August. 100th victim run over by train near Kandy Courts complex?